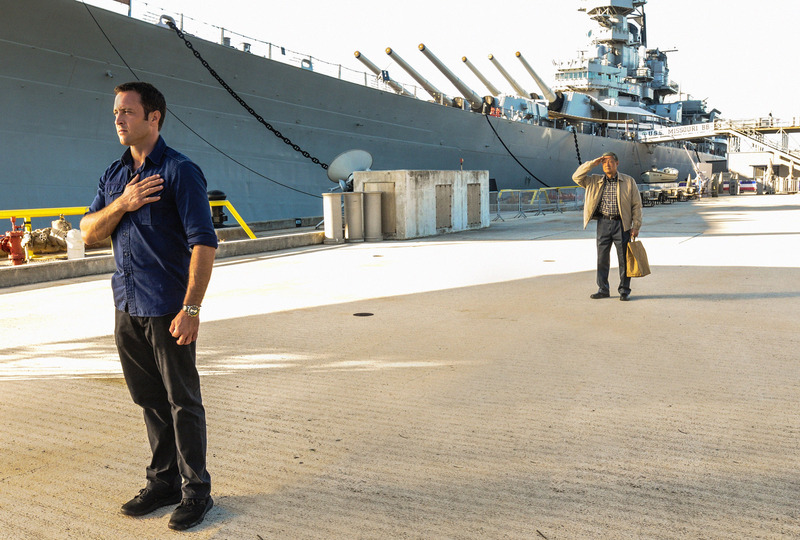 Starting this Saturday, December 7 through December 13, visitors to the Battleship Missouri Memorial will enjoy a special sneak preview of the ‘Hawaii Five-0’ episode that will later air nationwide on Friday, December 13, 9PM ET/PT, on the CBS Television Network. Titled ‘Ho‘onani Makuakane’ (‘Honor Thy Father’), the episode focuses on the attempted murder of a Pearl Harbor veteran that leads ‘Five-0’ to use decades old evidence to investigate a deadly crime committed within the internment camps holding Americans of Japanese ancestry on Oahu during World War II. A remembrance ceremony using actual World War II veterans was filmed at the Battleship Missouri Memorial. December 7 — 8:00 a.m. – 4:00 p.m.
December 8 — 8:00 a.m. – 4:00 p.m.
December 9 — 2:00 p.m. – 4:00 p.m.
December 10 — 2:00 p.m. – 4:00 p.m.
December 11 — 8:00 a.m. – 4:00 p.m.
December 12 — 8:00 a.m. – 4:00 p.m.
December 13 — 11:00 a.m. – 4:00 p.m. Paid admission to the Battleship Missouri Memorial is required to see the ‘Hawaii Five-0’ sneak preview. Viewers watching the episode onboard the Missouri will also be interested in the special exhibit located near the educational classroom honoring America’s Nisei (second-generation U.S.-born Japanese-American citizens) veterans. Unveiled on Veterans Day, the exhibit stretches more than 50 feet long and includes dramatic photos, news articles and descriptive text on large display panels, and a video telling the story of how these Americans of Japanese ancestry overcame the prejudice and questioning of their loyalty at World War II’s outset to earn acclaim and respect with their courageous exploits in Europe and the Pacific. America’s last and most famous battleship, the gigantic USS Missouri stretches three football fields long and stands 20 stories tall from keel to mast, and was home to more than 3,000 sailors while in service. The “Mighty Mo” protected America’s freedom in three wars – World War II, Korea, and Desert Storm – over a five-decade period, but is best known for being the site where General Douglas MacArthur and the Allied Forces accepted Imperial Japan’s surrender to end World War II and restore world peace on September 2, 1945. Today, as the Battleship Missouri Memorial, the USS Missouri is berthed at Pier Foxtrot 5 on Ford Island in Pearl Harbor, standing bow-to-bow to the sunken USS Arizona and creating a stirring bond between America’s two battleships signifying the start and end of World War II. Photo courtesy Norman Shapiro of CBS.